Russia has denied a top Nato general's allegation it may be secretly sending supplies to the Taliban in Afghanistan. Gen Curtis Scaparrotti told lawmakers in Washington on Thursday that Moscow was "perhaps" supplying the extremist group. On Friday, Zamir Kabulov, the Kremlin's special envoy in Afghanistan, said the allegation was "absolutely false". 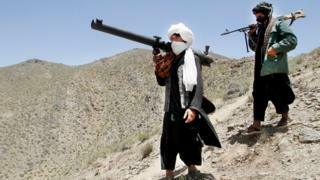 Russia has previously said its limited contact with the Taliban is aimed at bringing them to the negotiating table. Moscow considers the Taliban a terrorist organisation, and backed the Northern Alliance against the group in the civil war of the 1990s. But in December 2015 it did concede "the Taliban interest objectively coincides with ours" in Russia's fight against so-called Islamic State. However, Gen Scaparrotti, Nato's Supreme Allied Commander in Europe, told a Senate Armed Services Committee hearing: "I've seen the influence of Russia of late - increased influence in terms of association and perhaps even supply to the Taliban." He gave no further information to back up the allegation. Softening its approach towards the Afghan Taliban is a dramatic and somewhat unexpected shift for Russia. But ties have improved over the past year, with several Russian officials publicly acknowledging Moscow's "contacts" with the Taliban. They cite two reasons: ensuring the security of Russian citizens and political offices in areas where the Taliban has recently expanded its territorial control; and countering IS, which established its regional branch in Afghanistan in January 2015. The Afghan Taliban's assurances it will keep IS away from Russia's borders and those of other regional players, including Iran and China, have proved particularly important. But this new softening has led a number of high ranking American military officials to accuse Russia of undermining the Afghan government and its US/Nato allies and "legitimizing" the Taliban. Western officials also say that Russia is using the emergence of IS in Afghanistan as an excuse to justify its meddling in the country. Meanwhile, Afghan officials have repeatedly reminded Moscow that instead of establishing links with non-state actors, it should work with the government for regional peace and stability. The comments came a month after the US commander of Nato forces in Afghanistan said Russia was encouraging the Taliban and providing them with diplomatic cover in a bid to undermine US influence and defeat Nato. But Mr Kabulov told RIA Novosti state news agency on Friday: "These fabrications are designed, as we have repeatedly underlined, to justify the failure of the US military and politicians in the Afghan campaign. There is no other explanation."